China faces many challenges, from high levels of corporate debt and new home inventories to "zombie" state-owned companies and capital outflows. Will these challenges result in a hard landing, or will they contribute to gradual slower growth and greater volatility? These are important questions for investors because China accounts for about one-third of global growth, a larger share than the U.S., Europe and Japan combined. Visit matthewsasia.com/understanding-china for more information. 2018 was a challenging year for the Asian stock market, driven by trade concerns and monetary policy issues in both the U.S. and China. While investor confidence may have fallen, we believe Asia's economic fundamentals remain resilient and the region should continue as a key driver of global growth over the coming decade. Please join us for an exclusive webcast with Matthews Asia's Chief Investment Officer Robert Horrocks, PhD, and Portfolio Strategist David Dali for an interactive discussion on what to expect in 2019 and beyond. President Trump and Chinese President Xi Jinping are scheduled to meet about trade tariffs at the upcoming G20 Summit. Investors are watching closely for a resolution of the trade dispute, which has both political and economic implications. Please join us for a webcast with Investment Strategist Andy Rothman as he interprets the outcome of the historic meeting. The first half of 2018 was challenging for emerging markets, with rising interest rates, trade disputes, weaker earnings and Turkey and Argentina dominating headlines. While investor confidence may have fallen, we believe Asia's economic fundamentals make the region resilient and distinguish it from other emerging markets. As tensions appear to be easing on the Korean peninsula, a further potential catalyst for change is the upcoming summit between U.S. President Donald Trump and North Korean leader Kim Jong-Un. History indicates that such negotiations often don't bring meaningful change to the region, but could this time be different? Any kind of demilitarization and economic reconciliation between North and South Korea could have important longer term implications for investors on the peninsula and across the region. For investors interested in capturing China’s long-term growth potential, lower volatility portfolios made up of high-quality stocks may have strong appeal. Chinese equities present an intriguing total return opportunity, anchored by attractive dividend yields and improving dividend growth prospects. Meanwhile, China’s smaller companies, which tend to be less volatile than their large-cap peers, are riding a wave of innovation and are positioned to come into their own as investment opportunities in 2018. Please join China Strategist Andy Rothman along with Portfolio Managers Sherwood Zhang and Tiffany Hsiao as they discuss. In 2018, will the U.S. market continue to power up on expanding margins? What would that mean for the rest of the world’s economies? Will it signal a shift among investors toward active strategies that are better able to invest down the market-cap scale? If so, then the new year may be one in which the style of portfolio flows into Asia's economies starts to change. It may also be that Asia is once again seen as a separate region from the emerging markets. We invite you to join Matthews Asia’s Chief Investment Officer Robert Horrocks, PhD, in a discussion about the most likely global investment scenarios for 2018. Please join Investment Strategist Andy Rothman, who will provide a macroeconomic overview of China and offer his outlook for the coming year. Portfolio Manager Andrew Mattock will give his perspective on what happened in China’s stock market over the past year and give insight on what investors can expect in 2018. Asia’s markets have maintained their strong start throughout the year, yet investors still seem to be climbing a wall of worry about the sustainability of the region’s growth. We invite you to join Matthews Asia’s Chief Investment Officer, Robert Horrocks, PhD, for a webcast to address if the acceleration in earnings can be sustained, and if Asia’s growth can turn into equity returns. Additionally, he will discuss which countries and sectors are likely to prove resilient amidst global political and economic uncertainty and how active managers can generate attractive returns in this environment. We invite you to join Matthews Asia’s Michael Oh and Andy Rothman for a short webcast to discuss the potential risks and opportunities from rising tensions on the Korean peninsula. Investment Strategist Andy Rothman will discuss the Chinese, North Korean and American leadership perspectives and the risks for military conflict. Andy has been writing about relations between the three nations for many years and visited Pyongyang a decade ago, just prior to North Korea’s first nuclear test. He will explain why tough rhetoric is likely to create investment opportunities rather than war. Michael Oh, Lead Manager of the Matthews Korea Strategy, will explain how South Korean consumers and investors may respond to rising tensions, as well as discuss the impact on market liquidity and valuations. Michael also will look beyond Korea and cover any broader implications for the rest of Asia. The relative under performance of emerging markets over recent years has certainly hurt performance of globally diversified portfolios, shaking investor confidence. That said, the longer-term growth trends in Asia are still strong, and our observations on the ground point to very positive nearer-term signals. We believe this change signals a need to reassess how markets are likely to perform and to look beyond the U.S. for new sources of growth. Asia’s equity and fixed income markets not only tap into new growth opportunities but there are also solutions that can enhance risk-adjusted returns—even as rates are rising. Please join us for a live webcast with Yu Zhang, CFA, Lead Manager of the Matthews Asia Dividend and the Matthews China Dividend Strategies and Satya Patel, CFA, Lead Manager of the Matthews Asia Credit Opportunities and Co-Manager of the Matthews Asia Strategic Income Strategies. China's growth has a profound impact on the economies of Asia and securities markets around the world, and the country's economic headwinds are discussed daily in the media. Sensationalist stories are easier to submit to editors and garner a larger readership, but is there a more nuanced way of looking at the issues that may lead to better investment decisions? Join this live event to hear the key questions facing investor addressed. Is now a good time to be investing in Asia bonds and stocks? Recent market volatility has shaken the confidence of investors, particularly those buffeted by the relative underperformance of broad emerging markets. Where can investors look to find return to take advantage of this volatility? Teresa and David will also answer questions you may have about investing in Asia. Please register and submit your questions to engage in this live event. As active Japan investors, we seek quality growth opportunities across the market-cap spectrum. We believe Japanese companies will continue to flourish in the current market environment— in particular those positioned to benefit from growth opportunities in Asia, Japan's corporate governance improvements and domestic growth outlook. Kenichi will also answer questions you may have about investing in Japan. Please register and submit your questions to engage in this live event. Please register and submit your questions to engage in this live event. During the past year, Asia has been a source of equity market volatility, but Asia has also distinguished itself from other emerging markets in its resilience and its commitment to structural reform. Given the current valuation disparity between developed equity markets (such as the U.S. and Europe) and equity markets in Asia, it is a good time to appraise Asia's strengths and vulnerabilities in the context of today's global economic environment. We invite you to join Matthews Asia's Chief Investment Officer Robert Horrocks, Phd, and Portfolio Manager Kenneth Lowe, CFA, for a live webcast where they will share their thoughts on conditions in Asia given current market volatility. We invite you to join us today for a live Q&A discussion of the recent market events in China and an analysis of the broader impact on Asia's equity and fixed income markets. Our speakers on the call will be Investment Strategist Andy Rothman, Portfolio Manager Teresa Kong, CFA and Portfolio Manager Andrew Mattock, CFA. Just back from Vietnam, Bangladesh, Thailand, China, Singapore and Japan, join Portfolio Managers Taizo Ishida and Robert Harvey, CFA, as they share the on-the-ground sentiment, what they are hearing from companies and their outlook going forward. While there is plenty of uncertainty in the markets today, periods of uncertainty often lead to opportunities for investors focused on what really matters in the years and decades ahead. We believe the emerging and frontier markets of Asia represent the most compelling growth opportunities available to investors. Please register and submit your questions to engage in this live event. 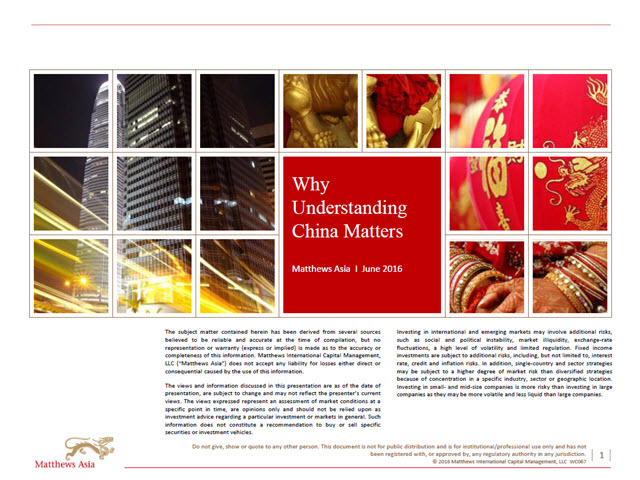 Matthews Asia Portfolio Managers provide quarterly insights on Asia, as well as our strategies for investing in the region.